I'm channeling my inner Donna today. That means I'm taking something junky and rustic and making it funky and fabulous. 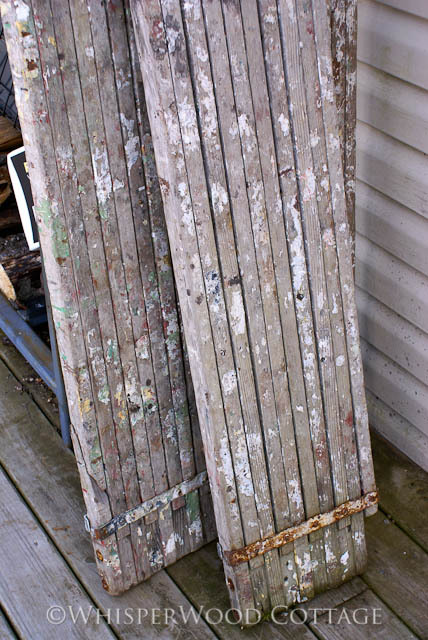 I picked up these three scaffold planks for $1 at an auction a couple summers ago. They are about 6 feet long but expand to almost 10 feet. Seriously cool! They are splattered in paint, which leads me to believe that a painter had put these to good use over the years. Why no one wanted them was beyond me. Couldn't they see the potential? 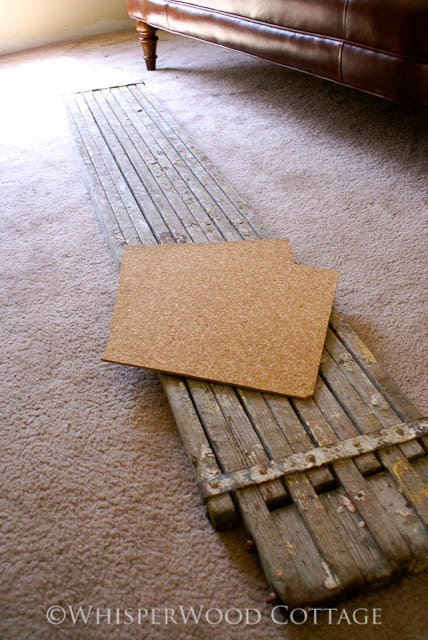 I also had a few squares of cork bulletin board that I had found at a garage sale at some point. So, what would you do with 1 scaffold plank and 2 cork squares? Or better yet, what do you think "I" would do with them? I have no idea what you're going to do with them but I'm sure it will be fabulous. Those planks put together would make one heck of a farm table top. I'm a bit jealous you found these for a buck. tables are hot right now. You may want to make an entire set. I can see one being a sofa height, one being a coffee table, and then cut up the other one to make small end tables... Of course, we know they would be awesome shelves or benches too. Hang them on a big wall vertically, with a little space in between each one. OMGosh, my thoughts overflow :-) They are wonderful! I agree! These are seriously cool! Can't wait to see what you create. I'm thinking message center... Sand them down a little (not a lot), attach a cork square, hooks, a square of chalkboard.... I'm feeling it! Can't wait to see what you actually did do with them.... very cool, I'd be all over them! I would put them in my studio! They would make cool work tables for sure!! Or I would hang them on the wall with cool junk hanging on them like a wreath, frames, mirrors, chalkboard, and things like that!! These are awesome - I have no idea what you might use them for. Can't wait to find out!! It could be a cool headboard for a bed? Or a long sofa table, or crafting table? I would put a cute old frame around the cork boards and make a cute little message board or keep cute notes/ cards or ideas! Can't wait to see what you do with them! i'd use the scaffold planks for benches on my patio that i'd keep movable so they could also be used in the yard for large family gatherings. great find! I dont even know what I would do with them.....they are seriously so cool. I think I would just hang them on the wall and stare at them :) Very very awesome find my dear!! Actually, they would make a really cool potting/garden table. You could put hooks on one and hang gardening tools on it. Im sure whatever plans you have for them are amazing! !